“We wrap you in this Quilt of Valor, Art,” Princeton Police Chief Thomas Root humbly said to World War II Veteran Arthur Seeds as he wrapped him in a quilt specially made for the WWII Veteran by the local Illinois Valley Quilts of Valor Group at Rep. Dan Swanson’s Veterans’ Health Fair in Princeton on Thursday, August 31st. Honoring the longtime Neponset/ Buda area farmer for his service to our country was one of many ways Veterans’ lives were touched during the third of three Veterans’ Health Fairs that Rep. Dan Swanson (R-Alpha) put on for Mercer, Knox, and Bureau Counties beginning on Tuesday. 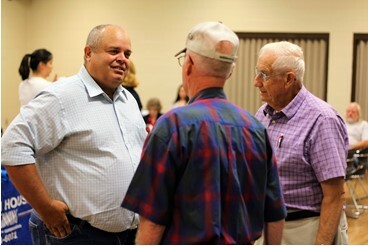 Bureau County’s event was hosted at the Bureau County Metro Center in Princeton. Dozens of attendees joined dozens of exhibitors representing state, local, and community agencies in providing information to Veterans and seniors in attendance. Monical’s Pizza hosted lunch at the Princeton event. Taking great constituent service on the road, Rep. Swanson also hosted Veterans’ Resources Fairs in Aledo on Tuesday, August 29th and in Galesburg on Wednesday, August 30th.